The Adventures of the Laughing Dog! Enjoy the "Adventures of the Laughing Dog," as captured in our latest store video. The LOL Rollover Rover, fondly referred to as "Laughing Dog" here at the New York Costumes shop, takes center stage with his hysterical belly laughing and rolling-on-the-floor antics. Yes friends, that's the Rollover Rover aka Laughing Dog for you. Creature Hands! Realistic Amphibian Skin Texture. ... as in Creature from the Black Lagoon! 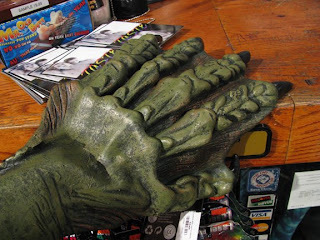 Now at New York Costumes, we have new monster gloves for your swamp creature costume endeavors! These highly detailed swamp monster gloves will bend and flex in accord with even your most subtle hand and finger movements. Webbed fingers, black claws, and a very realistic amphibian skin texture -perfect for water monster costumes or even on their on! LED Lightstick, Flashlight... and whistle?! We just received a new shipment of some very cool LED lightsticks here at New York Costumes, your downtown NYC Halloween Adventure store. 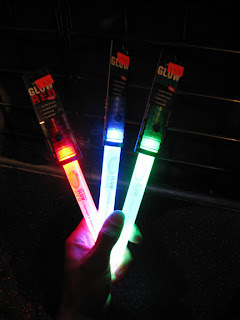 Upon browsing for new product arrivals, I came across these sleek little glow sticks near register 1. The compact and grab-able look of these light-up-ables by Life Gear led me to, well, grab one. And that was before I even noticed the "Try Me" message printed on them. These LED lightsticks run on batteries (which are included). They have a little black button near the top which serves as an on switch and operations switch. Click once to light the glow stick body (green, red, or blue), which looks just like a normal snap-to-activate glow stick. Click again to activate the flashlight, which shines out of the top of the stick. Click again to activate the flasher, which makes the glowing body flash on and off. The last click in the cycle turns off all the lights. Flip the glow stick upside down, and you will find the build-in whistle piece. Flash light, flasher, and whistle? Not only is this thing great for rave parties, but it would serve well as a personal emergency device. The "red cross" -looking symbol on the glow stick implies this as well. The Life Gear glow stick lights for up to 200 hours ("light run time varies based on usage and battery conditions," says the packaging). Initial batteries are included, and replacement batteries are free with a mail in to the company (does not include shipping & handling). We've got these in red, green, and blue here in the New York Costumes / Halloween Adventure store. 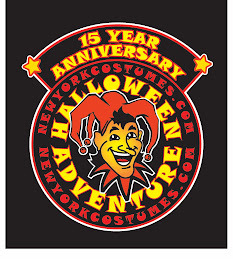 And we're currently uploading them to the www.newyorkcostumes.com website. More photos of these Life Gear lightsticks can be found below, for those inquiring eyes. Enjoy. 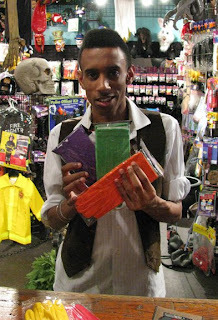 We are pleased to welcome Francis Andre to the media team here at New York Costumes in the East Village. Francis Andre is a wardrobe stylist and image consultant. Living in NYC all his life he grew to love fashion at a young age, and from there he started to learn the trade of garment construction as well as style and style illustration. He later found out that he had a love for Fashion and Nightlife public relations. He currently works as Nightlife & Style Public Relations Director at New York Costumes. He implements his style and NYC club kid nightlife knowledge into his work with the media team at New York Costumes. Stay tuned for costume and fashion blogging from Francis. And if you haven't already seen his first video blog for New York Costumes, you can view it here: "Opulence" at New York Costumes.